Love this helmet! Highly recommend it. I am a new rider and decided to start with a half helmet with no drop down visor (I wear glasses). 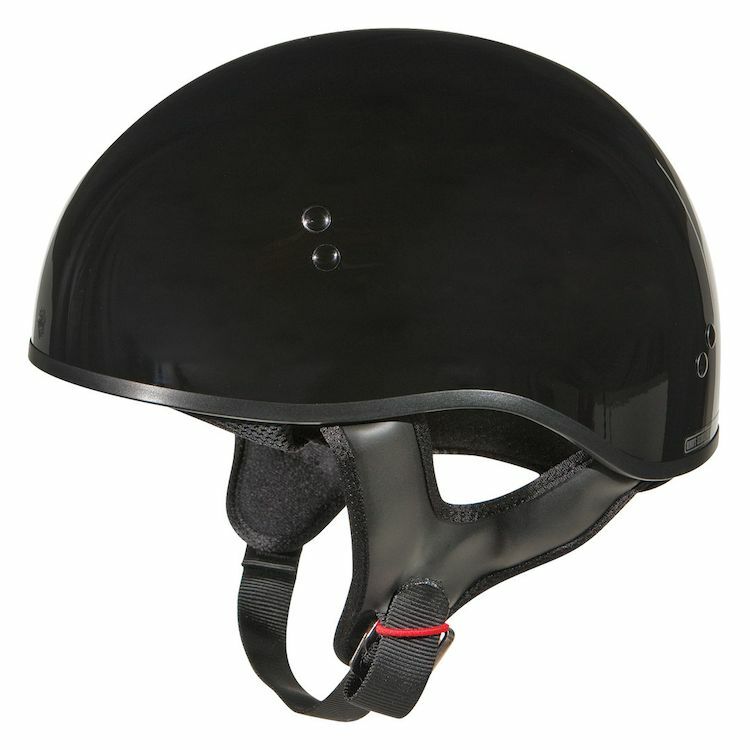 This helmet is great for low speed, getting above 35mph you will get wind noise which I expected. At highway speed, I also got the feeling the helmet is trying to lift off your head. Note that my bike does not have a windshield. Again I found the helmet comfortable at low speed riding around town and taking my riders course (did not bake in the hot sun at low speed). I am looking at getting a 2nd helmet, a full face helmet. I understand most riders have more than one helmet. Just received my new helmet and took it for a spin for the past few days. Coming from a full face helmet, this helmet has changed my world when it comes to riding. It feels as if you have nothing on but knowing that your dome is protected is nice. The helmet fit perfectly, and the straps were easily manageable. I read a few complaints that the strap slapped the face going at high speeds. They must have been going very high because at 70 miles an hour, I felt no discomfort or slapping. All in all, this is the best for the money. Love the looks, the feel and style. I highly recommend. I supose that it is what i payed for talibg into accound the price.. the interior is like a bicycle helmet! Just with a liner. I thought it was going to be somewhat more advance. But well. That's what you get for that price i supose. It looks cool but it gives you the toad look which also i was hopping not to get.. but well.. it gets the job donde.. Needed a lid for casual, back roads and urban riding. Was worried about sizing but size chart was right on. Really fits the bill. GREAT Value. A true Bang for your buck! The only issue I have with this great helmet is the strap. You have to find a way to tuck it in or it will slap the S out of your face in the wind. This is the second one of these helmets I've purchased. I loved the first one so much I wanted another since I couldn't just buy the replaceable liner which was worn out. When I got this new one in (same model # from 2 years ago), it had a thinner chinstrap which flapped around much more than the original. I didn't like this change at all because the helmet has a chincy strap holder but the older style didn't need the end of the strap held as it was a heavier material and didn't flap around. I bought this helmet to replace my G55s. The G55s fit tight at 2XL, but was liveable.I had hoped that this helmet would be at least close. I have a Huge Noggin and this helmet fit like it was molded FOR my head. I have never had such a good fit! Cons: No Fancy chin strap ( Not that there is anything wrong with that), No Neck cover for the cooler times. For the price I guess you shouldn't expect much. One of the biggest drawbacks is that there isn't a snap on the strap, so at freeways speeds it will slap the cr@p out of you unless you tuck in back in under your chin. The inside fabric is very minimal and can easily come out when you're not wearing it. I think the next one I'll make sure it has the snap on it. It is a good price for what a half helmet should be.